Parle Monaco is one of the crazy and a very different sweet and salt biscuit which has made a unique mark on the market. 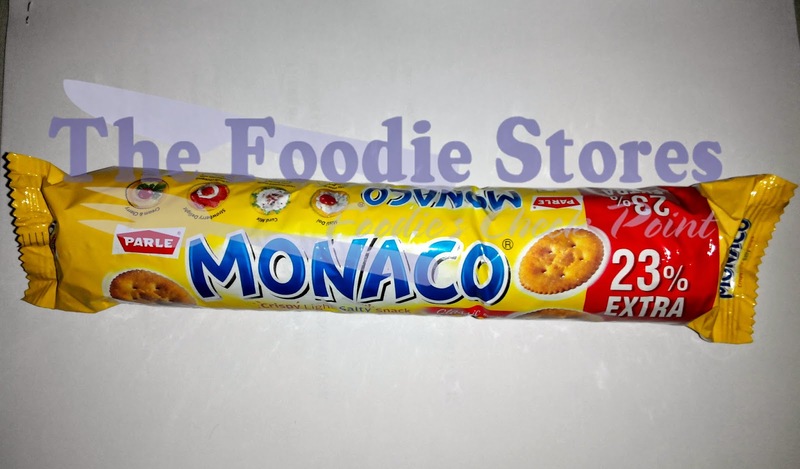 Parle Monaco or famously called as Monaco is a sweet and salt round cut designed biscuit which tasty any time of the day. I basically love this biscuit because it's different and unique from a regular biscuit. Not only that Monaco is famous for its topping recipes, Many people love to eat Monaco with some crazy toppings which are tasty and can impress anyone. It is also cheap to buy and easy to prepare a unique Monaco topping and the biscuit will surely fill the taste in any kind of a topping you make, even a bad topping. Parle is one of the largest biscuit manufacturers in India survived over 80 years. Parle's success story started with Parle-G which made headlines worldwide for its sales and became the worlds largest seller. 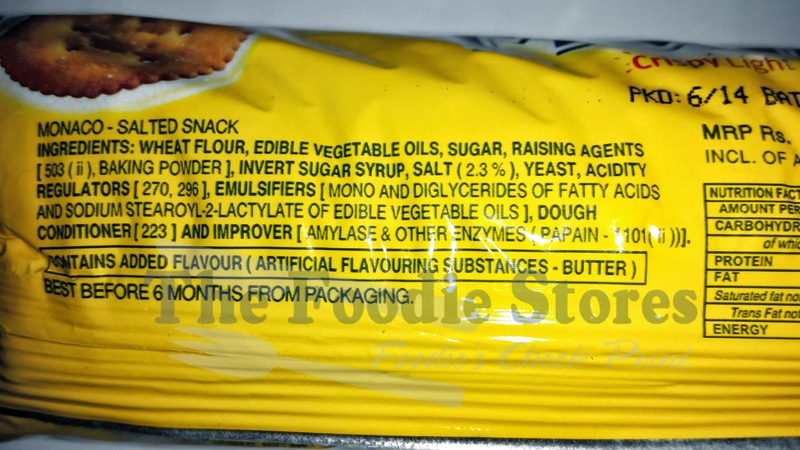 According to them, Parle symbolizes quality and nutrition but for us, parle means tasty biscuit. Today Parle biscuits are so famous that it is available anywhere in India, from high tech city market to a corner hut shop in a village. Monaco might sound like a sovereign city-state located on the French Riviera in Western Europe but Parle Monaco Biscuit is purely Desi. Monaco Biscuits are popular biscuit in India and almost all age groups like this biscuit. The reason you are reading my review is that you like this biscuit. Parle Monaco Biscuit is a unique salt and sugar based biscuit tastes differently, I mean the softness of the butter essence and the crunchy sound makes you horny to have more. The toppings like butter jam, cream cherry and much more are famous because of its amazing taste. I will be writing some of the famous Monaco topping recipes here so that you can try it at home. Tel - (022)6691 6911 - 15. Fax - (022)6691 6926. V.S. Khandekar Marg, Vile-Parle East, Mumbai - 400057, Maharashtra. SP-2/4 RIICO Ind. Area. Delhi Jaipur Road, Dist. Alwar. Neemrana - 301 705 (Rajasthan). 36.8 KM Milestone, Delhi Rohtak Road, Village Sankhol, Near Bahadurgarh, Dist Jhajjar, Haryana - 124 507. Tel - (01276)241547/48. Fax - (01276)241406. 15.K.M.Stone, Tumkur Road, (N.H.No.4), Bangalore, KA - 560 073. Behind Shekh Pir, Ler Village, Bhuj, Kutch, GJ - 370 001. Village Tambati, P.O. : Donut, Taluka: Khalapur, Dist: Raigad - 410 202. Tel - (022)6691 6911 - 15. Fax - (022)5691 6926 - 27. Contact Person: Mr. Manish Mishra. Pankaj Plaza, Site No. 37/38, Plot No. 15, Flat No. 106/206, Local Shopping Center, Kalkajee, New Delhi - 110 019. Tel - (011) 3293 6614, 4167 5282, 4162 9978. Telefax - (011)2647 1678. Contact Person: Mr. Rajiv Selot. 15, K.M. Stone, Tumkur Road, (N.H. No. 4), Bangalore - 560073. Tel - 080 309 12500, 837 2807. Fax - (080)839 8800 839 8825. G-1, "Samarpan" 82, Sarat Bose Road, Kolkata - 700 026. Telfax - (033) 474 8176. Contact Person: Mr. Vinod Sharma.